A few years after I began writing I was given two of my Grandpa Tommy’s treasure: his air organ and his typewriter. I quickly decided the organ wasn’t for me — or maybe it was my parents who decided that after one too many of my horrible concerts. But I did covet learning how to type, and so the journey began. Grandpa wrote poetry and called himself “The Coal Miner Poet” because he was a coal miner as well as a poet. Maybe because I barely remembered him I decided to start writing — I wanted to feel connected to him. 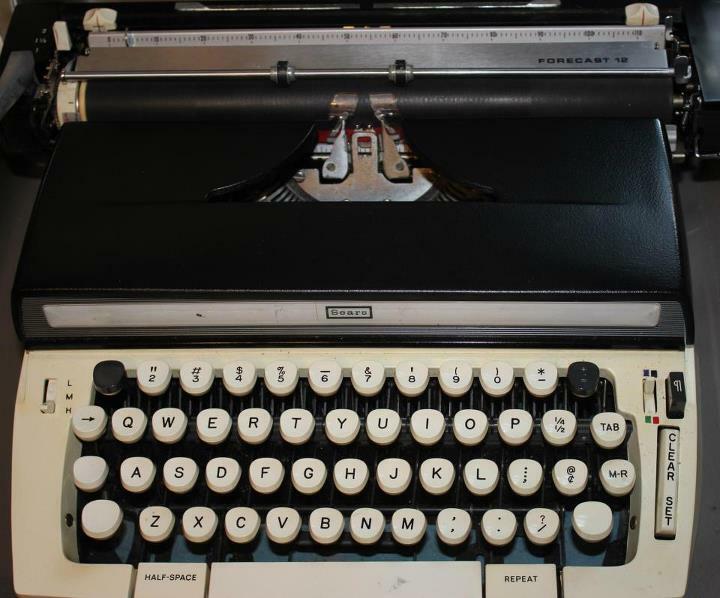 Just after I got the typewriter I remember hitting the space bar numerous times until a cousin looked at me blankly. “You know you only have to tap it once, right?” I didn’t know. I had no clue how to use it. My memory is vague as to why the typewriter moved on — I believe a closer relative asked for it, but I do know that soon I was left without a typewriter. After having mostly mastered the technique (You should see how quickly I can type now! It’s effortless on a computer by comparison) and having written an unfathomable 13 pages of a “novel” (when I was in 7th grade), I felt bereft without it. Recently my husband and I were on our way to the dunes. I have been redecorating my writing room (I have insisted on a writing space in every home we have lived in, even when it has had to be a writing nook), and I mentioned that I really wanted a typewriter. “Not to use, of course,” I said. I had been trolling for them the night before on ebay. “I want an inexpensive one, just a starter one, if you will,” I said. We made our usual stop at the St. Stan’s Thrift Shop in Michigan City when we arrived in town. There we generally stock up on inexpensive beach books, quaint jewelry, and LP’s. They know our faces, and it’s nice to chat about the weather and load our arms with magazines and such. Right after we walked into the shop I happened to look beneath one of the tables. In front of me was a Sears typewriter. I wanted to cry. And it was less than $10! I felt guilty buying it for so little. Barry and I joked that I could bring it onto the beach and use it as what it was: the original lap top computer. Of course in reality I brought pen and paper to the beach instead, but it was the first time I was eager to leave the water: I couldn’t wait to get home and put the typewriter in my writing room. A nod to my grandfather, the poet.